← Too Old To Care?? Yes, Ralph was working his magic again! I laughed out loud when I saw it! It had the sweetest, most lovely card inside, too. He’s so sentimental…one of the reasons I love him! When I got to Weight Watchers, my second gift for the day awaited me. I had been trying Very had all week, trying to make up for Monday’s anniversary lunch. I tracked and measured and watched everything. When I got on the scale I had lost 2.2 pounds!! I never expected that! I’m now back to where I was before vacation. Only a few more pounds and I’ll be at my personal goal, which will make me happy! I stopped at Goodwill on the way home and I may have bought some books. Stopped at the library to return some books and I may have bought some books…Hey…It’s my birthday! 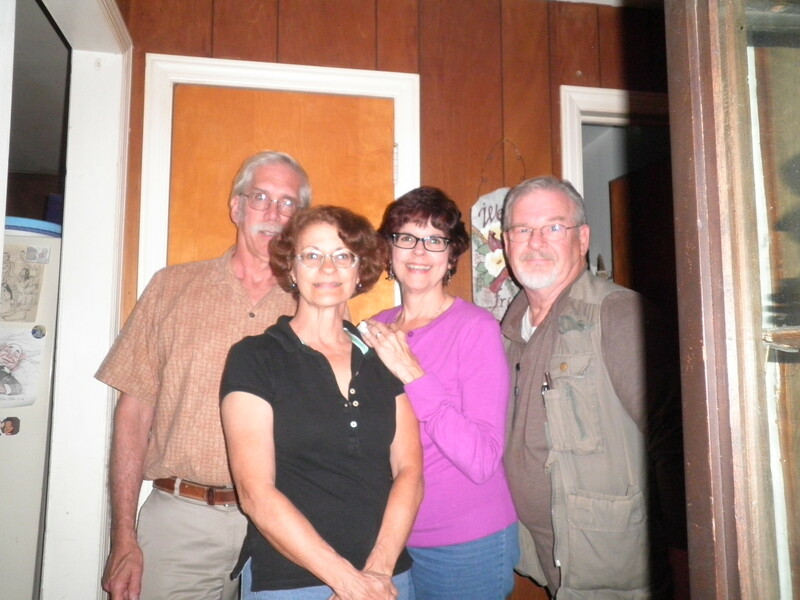 So I came home and really just hung out for a while. We knew that my nephew Michael would be coming for the evening festivities and since we had been away for his birthday, Ralph wanted to work on his birthday card. I spent my time reading. I’m reading an interesting book right now, which I’ll talk about later in the week. Didn’t want my bandaged finger to get wet, so I made the with my rubber glove on my left hand! Not as cumbersome as I thought it would be. 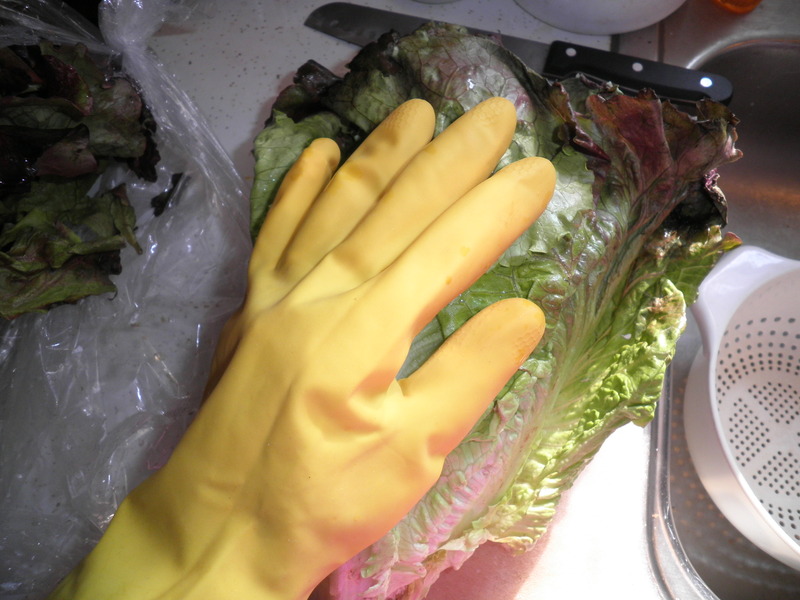 Got this red leaf lettuce at the produce market earlier in the week. It was cheaper than the regular Romaine. Score! 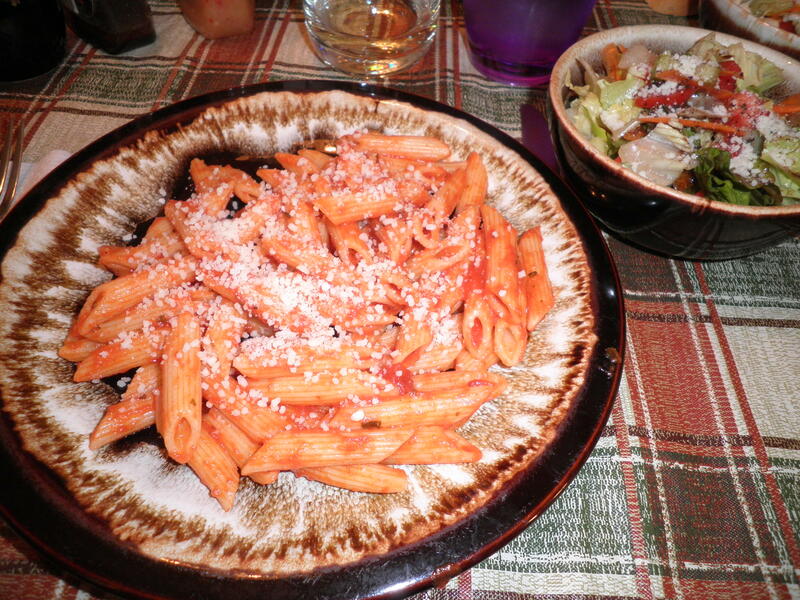 My birthday dinner…Ele’s yummy pasta sprinkled with my beloved Locatelli cheese, some of my big salad and yes that is wine. I decided it was my birthday and I could! This was all delicious. 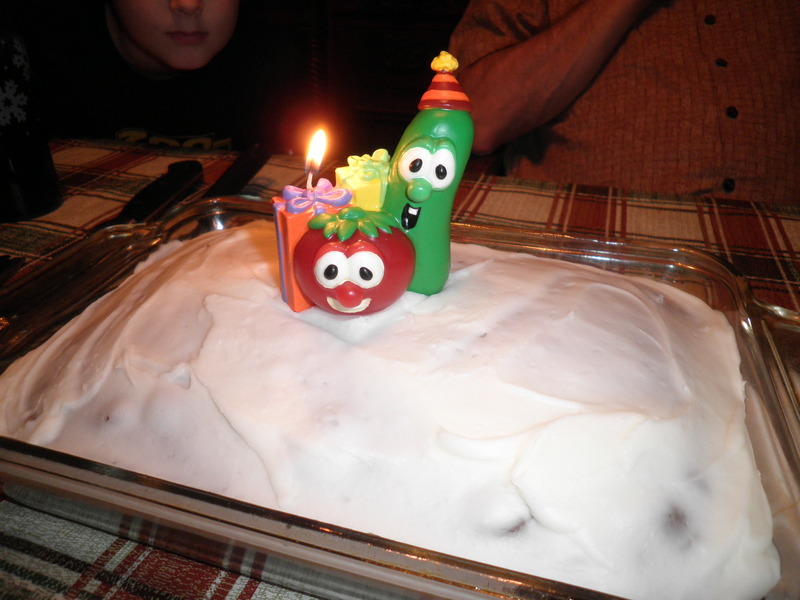 Ok, yes my birthday cake has a Veggie Tales candle on it! It was the only one we could find in the house and after all…I am a Vegetarian! A Mikey-eye view of us! He’s quite a good photographer! Ralph took me shopping for birthday presents on Friday and this sweater is one of the things I got. Too other pretty things, that I’ll show eventually. I got several Barnes & Noble gift cards which should bring my total up to what I need to finally buy my Nook. Now I have to decide which one I want. Also got a beautiful pair of earrings from Jim. I don’t know about anyone else, but I’d say I had an awfully nice birthday all around. But the celebrations aren’t over yet. As I’ve mentioned before, in our family we believe in the concept of the Birthday Month! I’m excited because my best friends Gail and Alice will be home today. I haven’t seen them since May! That’s a good Birthday present if you ask me! what a WONDERFUL birthday, fran!! i’d say it was full of all of your favourite things..and people! i love those veggie candles. and ralph did a fab job with his artistic card creation, once again. 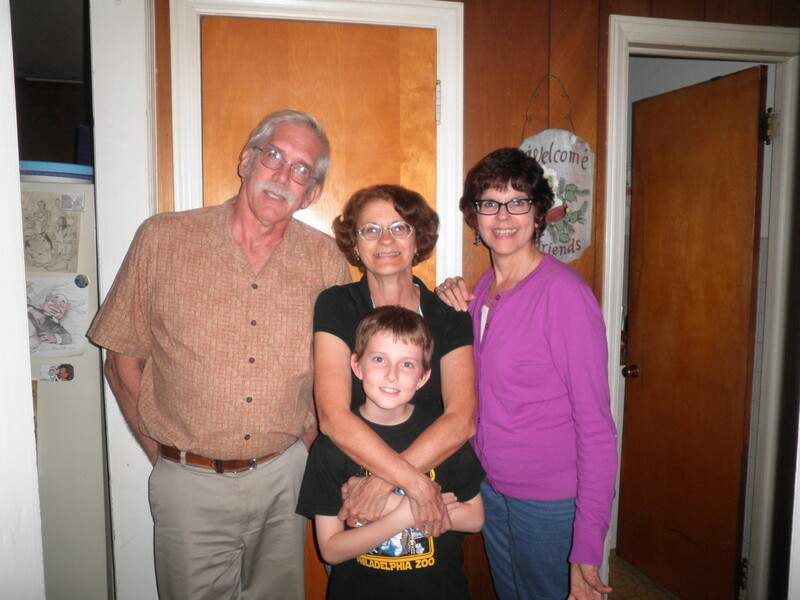 thanks for sharing the family photos – always good to see everyone together, looking so happy. have fun today with more celebrating! 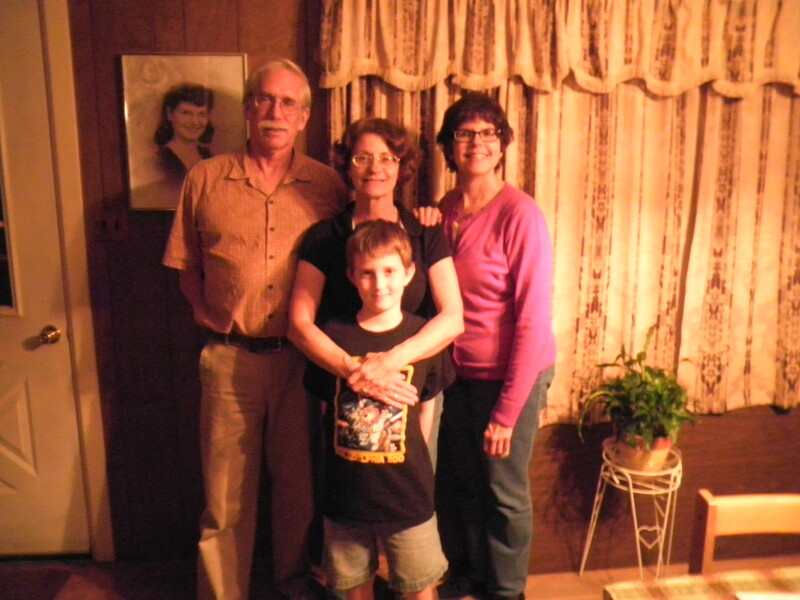 (we are holding family thanksgiving so we will be joining you in good times!). 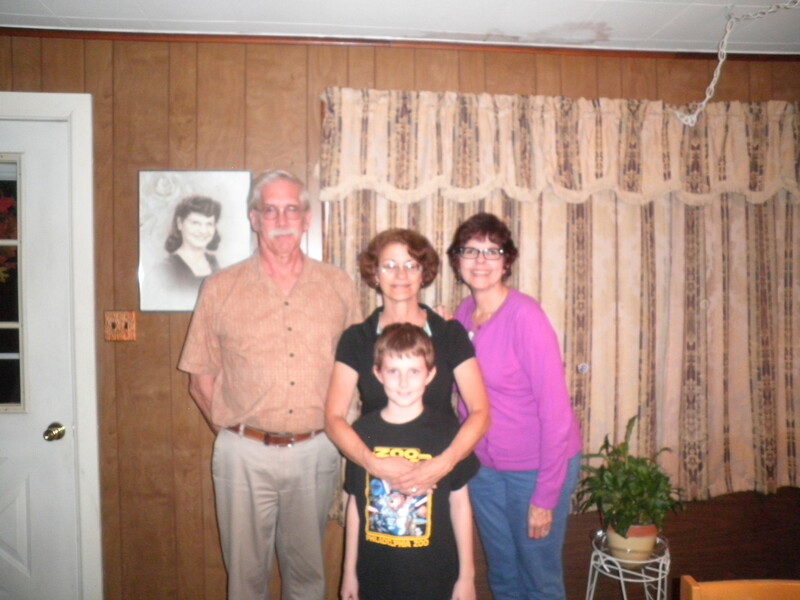 Cathy, have a wonderful Thanksgiving with the family. I had a great birthday and I’m feeling that this will be one of my best years yet! I had taken some dishes to the kitchen…when I got back…there were the Veggie Tales. I laughed!! I’ll tell Ralph that you liked the artwork. Enjoy your day!! 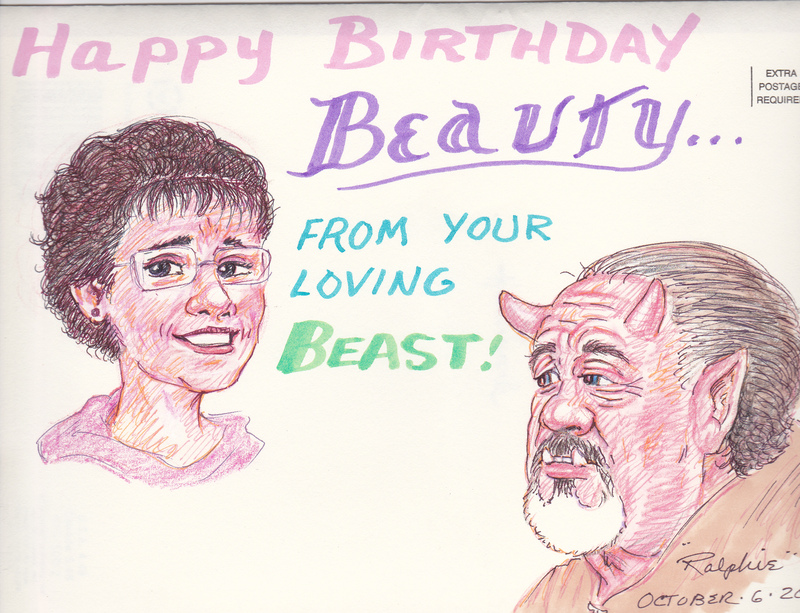 Looks like a great birthday, love the drawing! I would never think to put lemon frosting on chocolate cake! 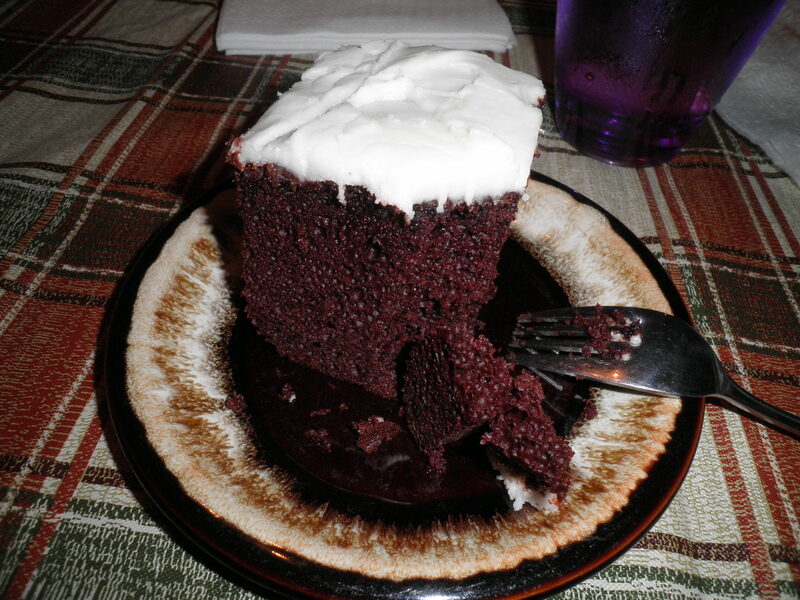 Stacie, this cake is so delicous…seriously! Glad you like the drawing! Ralph loves that “people he doesn’t know” like the drawings! It was a great day! Looks like you had a wonderful day! The cake sounds delicious—lemon and chocolate go so well together. Enjoy your birthday month! Thanks, Dana! We’re having fun! Hey, Suzi! Thanks, we had fun. Ralph’s are not easy to find these days…glad we found ours! Yours is an October baby, too…cool! what a great birthday! I love your husband’s work. He’s so talented. I love the veggie tales candle – it’s so perfect! Thanks, Mare, it was a great day. Yes, Ralph is very talented. He just amazes me sometimes!